The weather forecast for Saturday didn’t lift many spirits. Overcast skies, high temperatures barely hitting 60 degrees, light wind. Not the ideal situation for a day of sailing on the Hudson River. 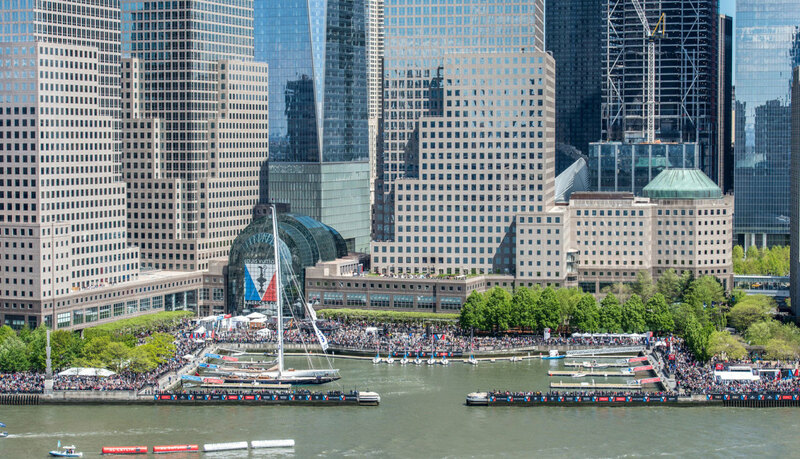 So I must admit I was just a bit surprised when I walked out of Brookfield Place in Manhattan’s financial district and found the America’s Cup race village absolutely bustling with sailors, race fans and all sorts of people excited to take in the racing action on the Hudson River. The lines out of the official America’s Cup store stretched half way down the dock, and I doubt that lower Manhattan has seen so many folks walking around in foulies. I was lucky enough to get a spot onboard the yacht Calypso, thanks to the good people at Alice Marshall Public Relations, to get a front row seat for the action. Well, what action the boats were able to drum up, that is. Saturday’s racing turned out to be a catch-as-catch-can event, with the first race getting called off due to a lack of wind, and the boats trying to get off a race whenever they could. In the end, the day’s one race that was successfully run went to Dean Barker and the SoftBank Japan team, however due to the conditions, it was determined that the race would be a “substitute” race, and would only count toward the overall standings if the Sunday racing conditions were equally poor. Lucky for everyone, Sunday turned out to be just the opposite of Saturday’s light wind, overcast mess. 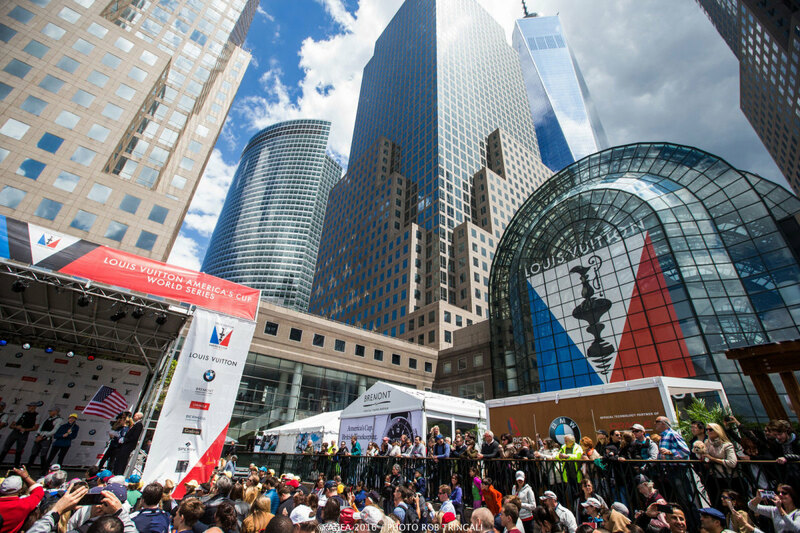 Bright blue skies and winds ranging from 15 to 20 knots gave the New York race fans the event they had been waiting for. The races went off without a hitch, and the day went to Emirates Team New Zealand, who took home a total of 52 additional points. Team Oracle was nipping at Emirates’ heals, taking second, with 50 points added to their overall standing. At the end of the event, Emirates is still in first overall with 244 total points, with Oracle a close second with 236 points and team Land Rover BAR in third with 227 points. All in all, the event was a resounding success for the fans and the sport in general. 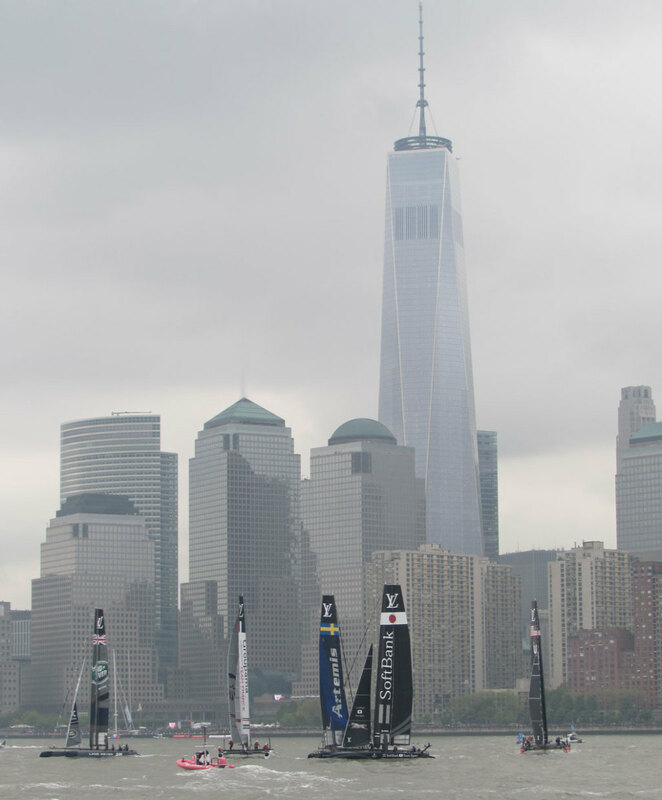 By staging the event in downtown Manhattan, the Louis Vuitton Cup was thrust into the forefront of many a news feed, bringing the high-speed action of America’s Cup sailing to the masses. 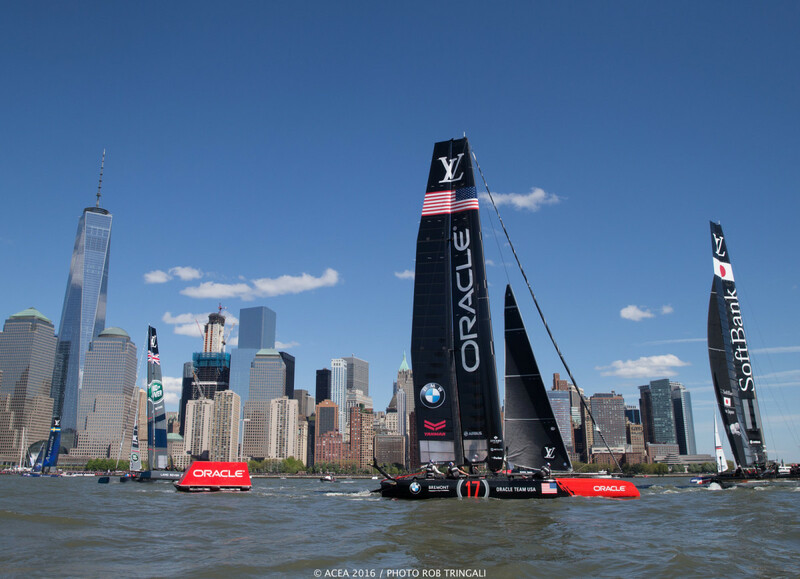 Hopefully, Larry Ellison’s gamble of holding the event on the Hudson, even with Saturday’s less than ideal weather, will show everyone just how exciting these events can be. Watch out Chicago, Louis Vuitton is coming for you next. Despite the light wind and overcast skies, Saturday’s racing was still an exciting scene.